Bill has captured the excitement and beauty of this firework display. 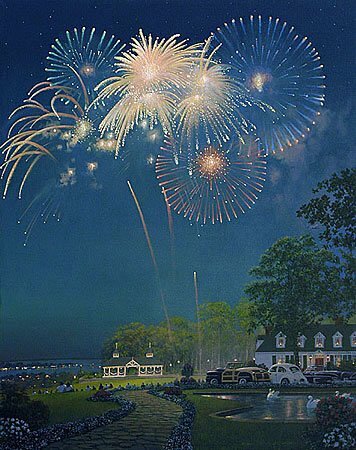 As the firework displays light up the night sky with a dazzling palette of color, we know it抯 time to celebrate summer at the Bay View Inn. The 150-year-old lodge features one of the most picturesque views in the Phillips Bay Highlands. The Inn is as renowned for the sumptuous meals served on a stone terrace overlooking both the Inner and Outer bays as it is for its nightly displays of patriotism during the month of July.